Abu Dhabi: The upgraded Mafraq-Ghuwaifat highway was officially inaugurated in Al Dhafra region on Wednesday in the presence of several dignitaries. The highway has been renamed Shaikh Khalifa Bin Zayed Road. 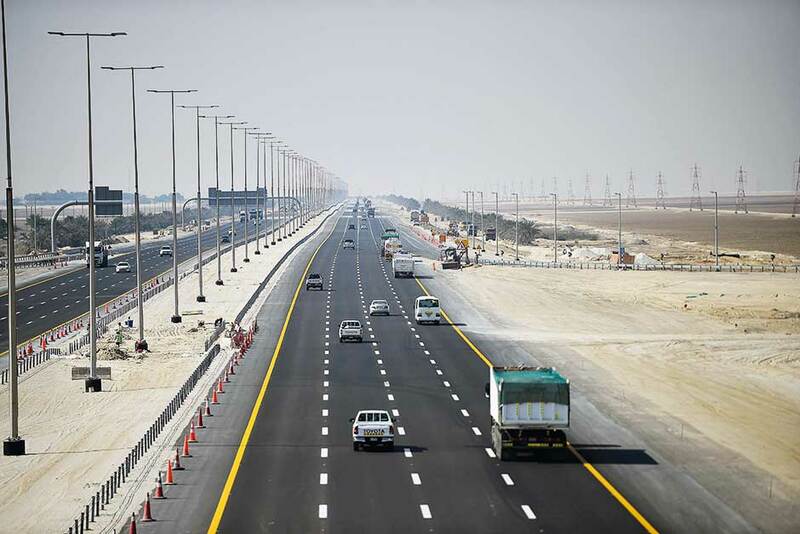 The road, which is the main route connecting the capital city to Al Dhafra region and Saudi Arabia, continued to remain open for vehicular traffic as the Dh5.3-billion upgrade was undertaken in phases. The improvement works covered 246 kilometres of the 327-kilometre highway, and they were designed to ease common concerns like congestion and weather-related hazards for motorists. “Many of the projects I work in are based in Al Dhafra region town of Mirfa, and sometimes I travel regularly between Mirfa and Abu Dhabi city. But this was no easy feat as the two-track highway was frequently congested,” said Noordeen Erakath, a 52-year-old oilfield services marketing manager from India. “One lane on the highway was always taken up by massive trailers and heavy vehicles, and the other was often slow moving, especially in the stretch between Habshan and Mirfa. These issues have been resolved completely because the upgraded highway has three to four lanes throughout,” he added. In fact, increasing the number of lanes along the route was one of the major changes to the highway. The two-lane carriageway is now at least three lanes wide over the 64-kilometre stretch from Barakah to Ghuwaifat, and up to four lanes wide in the 182 kilometres that span from Mafraq to Baynounah Forests. Each lane can accommodate a maximum of 2,500 vehicles per hour. The works, led by public facilities management company Musanada, began in March 2014, and were divided into six phases. “This is the most commonly used route by freight traffic for coming into and leaving the UAE. The upgrade should ease transport and trade along the route and allow for geographical, economic and social integration at the regional and emirate-wide level,” Khalid Hashem, executive director of land transport at Abu Dhabi emirate’s transport sector regulator, the Department of Transport, had said earlier during a media tour of the highway. Siddiq Manothiparambil, 32, an Indian operations manager, said he once used to dread his twice-monthly commute to project offices in Ruwais and Madinat Zayed. “The drive would easily take up to two-and-a-half hours to Ruwais, or even longer if there was a traffic incident on the highway. It was impossible to drive at the 140-kilometre maximum speed and there was tremendous traffic congestion at a bridge near Musaffah,” he explained. With the upgrades, however, Manothiparambil’s driving time has been reduced by nearly an hour, and a brand new interchange at Musaffah has ensured that there is no traffic jam at the start of the route. A total of 15 other new interchanges have also been constructed, and existing interchanges at Mafraq, Hameem, Abu Al Abyad and Madinat Zayed have been enhanced. At the same time, the highway is now fully lit with LED lamps in order to increase visibility and reduce fog-related risks. The overall asphalt level of the road has also been raised, and its drainage improved in order to prevent water accumulation. For motorist convenience, lay-bys and hard shoulders have been established, and there are petrol stations at two new locations, near Barakah and Mirfa. Camel underpasses have also been set up near Al Sila and Ghuwaifat so that farmers and camel owners can ensure the safe passage of camels.